This is No. 9 in the series. Please read my introduction and explanation here. I remember shortly before my father died, standing at the foot of his sickbed as two nuns prayed for him. Around his neck was a simple wooden cross, and he clutched it as they implored God on his behalf. His countenance I recall as well…lips a little tight, eyes held open, a look of readying oneself to meet a painful and significant challenge ahead. I couldn’t read my dad’s mind, of course, and his body language may have been expressing his bodily pain as much as anything else. But I suspect that, as he must have known his time on earth was short, he was also fearfully anticipating the flames of purgatory. As I mentioned in my previous post, the Catholic Church’s doctrine of Sacred Tradition, an extra-biblical but equally authoritative body of truth, has resulted in the promulgation of various teachings and practices not supported and often contradicted by Scripture. Purgatory is one of the most maddening Catholic inventions, especially when I consider how many millions of Catholics, my father included, must have died in horrific fear instead of joyful anticipation of finally reaching their eternal home. This verse is not saying that we will suffer in flames, as the Catholic Church interprets it. It’s saying that our works will be tested for genuineness and purity. If they pass the test, we will be rewarded. If they don’t, we will lose what rewards we might have gained. 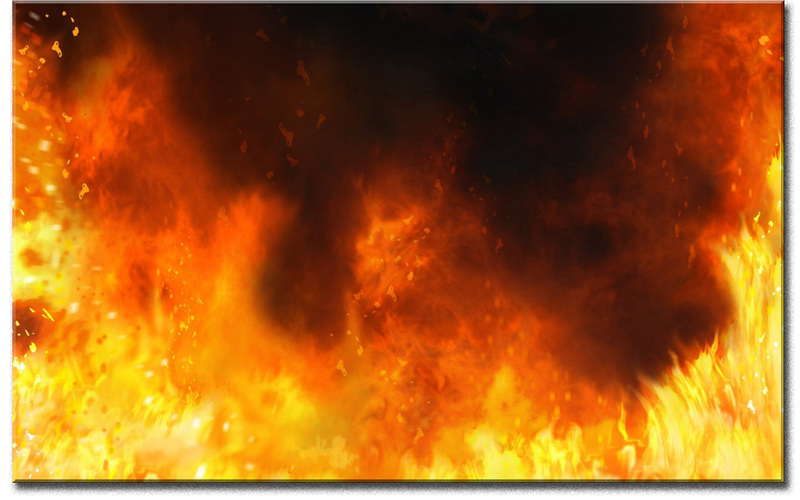 We will be saved, but “as” through fire – as one escapes a burning building with nothing but the clothes on his back, and nothing remaining behind him. 1 Peter 1:7 is also used to support the doctrine of Purgatory. Here Peter is acknowledging the “various trials” that his readers have been experiencing, encouraging them that they are a testing of their faith which will “result in praise and glory and honor at the revelation of Jesus Christ.” He compares their faith to gold which “perishes though it is tested by fire,” but their faith will remain. The fire is analogous to their trials. That’s it. Jesus’ warnings in Matthew 12 about the sin of blasphemy against the Holy Spirit, that will not be forgiven even in “the age to come” do not support the notion of Purgatory. Neither do the references to praying for the dead in 2 Maccabees, which is a non-canonical, Apocryphal book. But what the notion of Purgatory supports is the Church’s teaching on indulgences, a way to earn an early parole for yourself or a loved one. Kind of like paying off someone’s layaway. That will be reason number 10. So the Church teaches that if we haven’t made sufficient payment for our sins in this life, the balance will be due in Purgatory. And the multiple verses that speak of Christ’s payment for and God’s forgiveness of our sins when we repent? This doctrine has the effect of greatly minimizing the payment that Jesus made to our account. If you read your Bible, i.e. the one with only 66 books, diligently you will note that your Bible refers God as refiner’s fire (Malachi 3:2). A silversmith will use fire to cleanse silver from impurities and he knows he completes his works when he can see his face reflected on that silver. Recall that when God creates the first man, Adam, he was created after His image. Zech 13:9 says that God will put one third into fire and refine them as one refines silver. When the prophet Isaiah saw the glory of God, he lamented his sinfulness and one of the seraphim took burning coal and touched his lips and then told him that his sin is forgiven. For sure the word purgatory is not in the Bible but neither is Trinity but your claim that purgatory is based on Tradition is simply false. Catholics do not pay the balance of our sin in purgatory – it is simply your caricature. We are being cleansed by God, the refiner’s fire, because nothing impure can enter heaven (Rev 21:27). We do suffer in purgatory but it is for our own good! Does suffering in purgatory contradict Christ’ last word in John’s Gospel? I recommend you to read Col 1:24 where Paul wrote he rejoiced in his (Paul’s) sufferings and in his (Paul’s) flesh he completes what is LACKING in Christ’ affliction. I understand that you reject apocrypha – my question for you is: how do you know that the Bible has only 66 books? Your Bible is supposed to be your only and highest authority, isn’t it? – if this is the case then you should be able to show at least one verse saying Scripture comprises 66 books. If no, then makes you so sure? Don’t tell me that it is based what your evangelical pastor or/and friends told you and you simply swallowed it like lamb in the slaughter house! They have no authority to declare which books belong to the Bible.